Recently I stumbled over this picture on the internet. I have not checked the numbers, but everybody knows that Apple is sitting on a huge pile of cash (the same goes for Microsoft, by the way). Of course, this number makes a good conspiracy theory about what might really be going on in Cupertino. Is Apple the last fire-drake of California jealously hoarding a pile of gold in his lair? I would like to object. 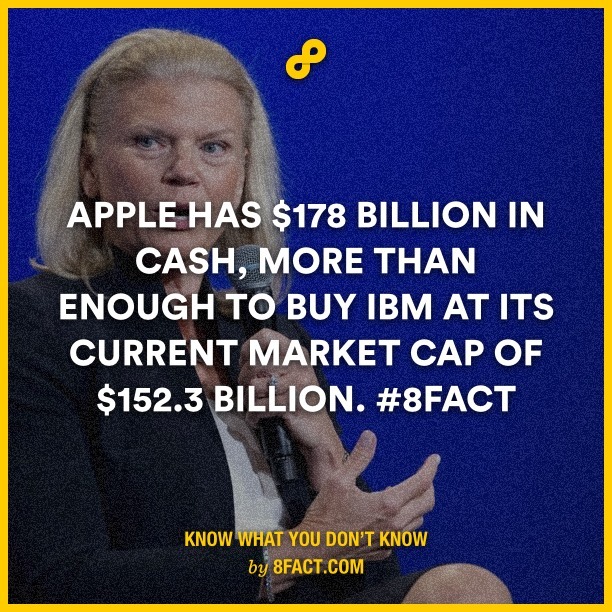 There are actually good economic reasons for Apple to have large cash holdings. Apple is arguably one of the most innovative companies of the last decade when it comes to consumer electronics. And investments in innovation have some distinct properties which make them different from normal capital investments such as building new production facilities or buying machinery. First of all, investments in innovation result in intangible assets. The largest part of an R&D budget is usually spent on the wages of scientists and engineers. These people need to acquire new knowledge to come up with new ideas. As a consequence, this knowledge is, for the most part, embedded in the human capital of these people and hard to codify within the organization. Such intangible assets are difficult to pledge as collateral to a bank loan. Due to the intangible nature of innovation outcomes, investments in innovation have large adjustments costs. Firms can not just stop paying their R&D staff in times of economic downturns. By doing so, they would lose the firm specific embodied knowledge if, for example, their people get hired by competitors. For that reason, firms tend to smooth their R&D spending over the business cycle with cash reserves. Another feature inherent to innovation activities is that their success is highly uncertain. The more radical the outcomes of an innovation project are, the less predictable they are. Capital markets do not like this kind of uncertainty too much. And on top of it, there is a problem of asymmetric information. Companies and entrepreneurs might have a good sense of what they want to achieve in a project and, more importantly, how they can do it. But lenders do not have a clue. The fear of wasting money on bad projects, which creditors can not distinguish from good projects (“lemons”), could lead, in the most extreme case, to a complete breakdown of a capital market for R&D projects. Simply telling potential lenders about your idea, what economists (in a more sophisticated form) call a signaling strategy, might not work because you cannot make sure that people bluntly steal your idea when you reveal it to them. Another important topic of information economics — agency costs — might also play an important role in the R&D context. The goals of managers versus owners of innovative companies might not be the same. Managers, and also bondholders, have the tendency to be more risk averse than equity holders. In that way, optimal long-term investment might suffer in favor of less uncertain projects which usually have lower prospective gains. Increasing the share of equity might thus be attractive from a governance perspective. Above, I only mentioned a few reasons why the financing of innovation by equity or retained earnings might be superior to debt financing by bondholders or banks. For a more elaborate discussion of the issues associated with the financing of innovation I’d like to refer the reader to an excellent review article by Hall and Lerner (2010). The topic is particularly interesting when it comes to small firms and start-ups. Their article devotes a whole section to the financing of innovative ideas by venture capital funds and angel investors. A more recent article, complementing the piece by Hall and Lerner, is recently brought out by Kerr and Nanda (2014). In there, they describe why empirically we still see a lot of bank financing of innovation and why equity financing has its own problems, especially in inducing an optimal level of experimentation. So, the scientific debate continues. In the meantime we can all be curious what kind of new products Apple plans to develop with all the money they have at hand. The conditions for a new breakthrough innovation are not too bad. At least from the financing side, it seems. Hall, B., and Lerner, J. (2010): “The financing of R&D and innovation.” In Handbook of the Economics of Innovation, eds. Hall, B. and Rosenberg, N. Netherlands: Elsevier, 609-639. Kerr, W. R., and Nanda, R. (2014): “Financing innovation,” NBER Working Paper 20676. Previous Previous post: How to get knowledge out of the ivory tower?